In advance of the Classical Weekend (8-10 March), our Crowdfunder campaign offers the golden opportunity to have your name associated with a newly-composed piece of music by supporting musical creativity in Sheffield! 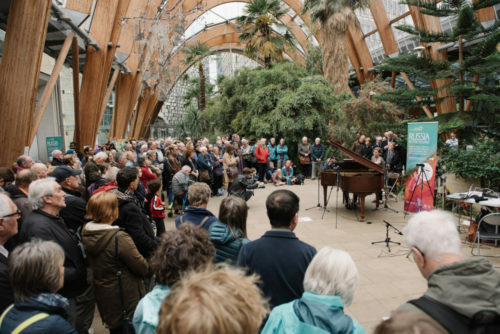 By giving to this project, you will be part of the creation of brand-new music from Sheffield-based composers, for the people of Sheffield. With your generosity we will reach our target of £2,000 by the end of February, which will enable these new pieces to be brought to life. One week into the campaign, over a quarter of the target amount has already been donated. Make your contribution today! All the compositions will be performed live during the weekend, which features over 40 concerts across the city, including these new commissions. Donors can have a piece dedicated to them or a loved one, conduct a choir or orchestra, enjoy free concert tickets, receive commemorative printed musical bars, and more. See our Crowdfunder page for details. Get involved today and help ensure a vibrant, contemporary, exciting musical experience for the whole city in March! Click here to visit our Crowdfunder page and make your contribution today.